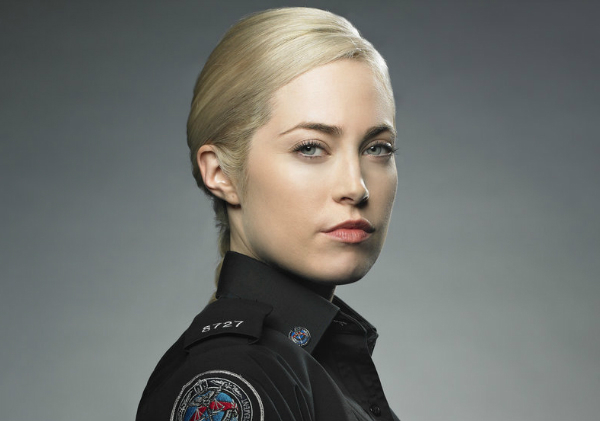 With the “Rookie Blue” premiere on ABC less than a month away, Charlotte Sullivan sat down with CableTV to discuss how her character has evolved, where season five is going, and about a possible show renewal. Q: It’s nice to have a full season with 22 episodes verses the 13 we normally get. Sullivan: Yeah it’s a lot. I think we are on episode eight right now, so it’s flying by, but we still have a lot to go. We have had a year off since we shot the season four finale and season five picks up I think like five hours later so we all might look a little different but we can’t help it. But people will know in the first episode she has gained weight, she has lost weight. But it was supposed to be like a couple of hours. Q: Lets discuss the season four finale. WTF. I had a heart attack. I think that episode was one of the best of the season. For starters how was it filming that last episode? Sullivan: It was a year ago. I think Missy had the hardest part for that episode because she had, had this relationship that had kind of form with Nick and then she is having to expose herself and when you are in a situation when someone is about to die the truth comes out. We all knew, come on. Hello. Q: As the character, Gale, do you think she knew that there was something going on with Andy/Nick? Sullivan: I think that whole season my character was really playing with this confidence issue. He [Nick] had left her before. So they have that history so she has always been on that high alert of that happening again and it made her spiral. I don’t know if she believes in fate, but everyone woman has that gut feeling that they kind of know and whether or not they acted on it she knew there was something there. I think she knew. I think she knew. Me and Missy are having to play this season, like could you imagine that happening to friends in real life and having to work together? Q: Well thats what I am wondering now. I know you can’t give away too much, but I am going to go with Sam ends up okay and so what do you do now? Q: Lets just say he is breathing. Sullivan: What if he was shot and he has amnesia? Q: Alright well maybe you can discuss the relationship between Gale and Andy this season. Sullivan: Yeah, if we are both in the room you have to act on that. We are kind of being partnered together and having to you know, sort of play that uncomfortable dynamic. Matty (who plays Oliver Shaw) is my favorite person of all time. I am constantly going to the writers asking them if I have a scene with him. Gale adores him. So it’s great to play. In terms of that friendship forming that is growing stronger and there is someone else I have connected with too, but I can’t tell you [Laughs]. Q: Are you going to be a one-woman girl this season? Sullivan: I think Gale thinks the world is her oyster. In terms of defining her sexuality, why does everyone have to know. It’s so private. It’s 2014. Someone else said playing a gay character is groundbreaking, but it’s not. I love playing a gay character. The gay community are my most favorite people in the world. It’s such a beautiful arc to see where I have come from. They could have just put me with a new guy, but now you are playing with sexual identity. I honestly love it. I told the writers I want to be a big fat whore this season. I have asked to have a bunch of women. Q: Can we calm this rumor down a little now. Is season 5 the last season? Sullivan: Well, we are contracted for a sixth season. Q: Does everyone want to come back again for another season? Sullivan: Yeah, we would be honored to do another one. It has been a gift. Q: Alright I am going to do a rapid fire of questions from people on Twitter. Stacy said, given what Gale went through last season how does Charlotte see her character evolving this season? Sullivan: Oh god. Stacy! The world is her oyster. Evelyn said now that Gale and Andy’s relation evolve this season? Is there a road to repair? Another one from Kazza, Travis said Chris wants him and Gale to be end game. Does you lean towards one more Holly/Gale or Chris/Gale? Sullivan: No. Travis keeps saying this and I keep saying I am gay. So the answer is no. [laughs]. Will Gale be effected on a more professional or personal level this year? Sullivan: Something happens to her while on the job and it makes her go crazy. So both. Her works starts to affect her at home. Sandra wants to know what has been your favorite relationship on the show? Do Nick and Gale have a conversation about Andy? Will we be seeing a softer side to Gale this season? Sullivan: Ahh she is a prickly pear. How far into filming are you and how are the new cast members working out? Sullivan: My character ignores the new guy. They are wonderful. Catch the premiere of “Rookie Blue” on ABC June 19 at 9 p.m. The 5 Most Gruesome Moments on “Mad Men”: Will Megan’s Death Be Another?